Yeah, Samsung knows you WANTED a Super AMOLED display on that Galaxy Tab but, unfortunately, it looks like that won't happen. We just saw the video (below). After I dried my eyes, Samsung's executives in the video reassured me that the Super TFT they opted for instead is still great looking and offers even better battery life than super AMOLED. They also said that the Super TFT was developed in parallel to the Super AMOLED (so it's not old news) and is the best TFT display that you can get. Does it look as good? No. I'm not sure if it's the screen glare in this picture or what, but at this point, I'd rather have that Galaxy S than the Galaxy Tab. 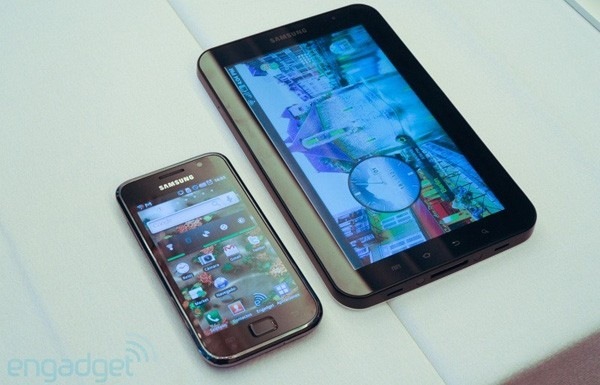 That Galaxy S just looks way better. I hope that my preference changes as more images (and live units) surface, because I really want to love the Galaxy Tab.